OTTAWA, ONTARIO and SARATOGA, CA – December 14, 2010 – Eurocom Corp., the leading developer of desktop replacement and mobile workstation technology, announced today that they have joined the increasingly popular SandForce Driven™ program, which enables end-users to easily identify a solid state drive (SSD) or now, even complete computing systems use SandForce® SSD Processors which optimize media storage access for an overall enhanced user experience. The program is now expanded to include system manufacturers that provide NAND Flash SSDs based on SandForce either as a standard storage configuration or as an option for build-to-order systems. Striving to deliver ultimate portability, capability and productivity for the most demanding applications, Eurocom chose SandForce Driven SSDs, with the cutting-edge DuraClass™ technology, in conjunction with its Mobile Workstations and Mobile Servers powered by Intel Xeon and Core processors to keep pace with CAD/CAM and 3D designers, engineers, architects, animators, and digital content creators who frequently travel and need access to powerful and energy-efficient computing. With the option of “hybrid” SSD and HDD arrays, including the option of a 4-way SandForce Driven OCZ Vertex 2 480GB SSD in a RAID 10 configuration, Eurocom’s desktop-rivaling portable systems also feature RAID 0, 1, or 5 options for maximized storage potential, further leveraging the benefits of SandForce Driven drives in these computing powerhouses. The demand for premium performance and unmatched reliability by Eurocom customers is the perfect arena for SandForce SSD offerings, and Eurocom is committed to continuous growth in the system integration market segment. "SandForce is excited to welcome Eurocom and their high-performance systems to the SandForce Driven program further expanding the penetration of SSDs in the market,” said Kent Smith, Senior Director of Product Marketing for SandForce. “Expanding the program beyond SSD manufacturers enables users to easily identify systems that are natively available with our innovative SSD Processors." Eurocom is the world’s leading developer of desktop replacement and mobile workstation technology. Eurocom began with the goal of creating the most advanced computer systems and using advanced engineering techniques typically unseen in the computer industry. The company has produced many firsts and continues to engineer well-balanced machines and VGA solutions that inspire and enable individuals to reach great possibilities. For more information on Eurocom or to customize a Mobile Workstation, please visit www.eurocom.com. SandForce is transforming data storage by pioneering the use of standard flash memory in enterprise, client, and industrial computing applications with its innovative SSD (Solid State Drive) Processors. By delivering unprecedented reliability, performance, and energy efficiency, SSDs based on patent-pending SandForce DuraClass technology unleash the full potential for mass-market adoption of SSDs using NAND flash memory. Founded in 2006, SandForce is funded by leading venture capital investors and first tier storage companies. For more information, visit SandForce at www.sandforce.com. 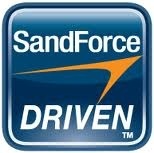 SandForce and the SandForce logo are registered trademarks, and DuraClass, DuraWrite, RAISE, SandForce Driven, and the SandForce Driven logo are trademarks of SandForce, Inc. All other trademarks are the property of their respective owners.